Evan Stone & The Translucent Ham Sandwich Band "Censor Me"
Evan Stone has made a name for himself as one of the most accomplished sidemen in the music industry. He began playing drums professionally in New York clubs by the age of 13 and after moving to California at the age of 16 he studied under master drummer Roy Burns (Benny Goodman, Woody Herman), along with Peter Erskine, Jeff Hamilton, and many more. His chops and skills behind the kit have made him an in-demand player, but today we want to introduce you to Evan Stone and the Translucent Ham Sandwich Band, which is his own ever-changing diverse group of multi-talented artists that he fronts. His new video for “Censor Me” is as bombastic and eclectic as his background and you’re in for a wild ride! One of the benefits of being a coveted session drummer is that Evan was bound to create a vast network of connections, touring the globe performing or recording with artists such as Toni Childs, Aly and AJ, Maynard Ferguson, and Greg Adams Band (Tower of Power), just to name a few. When it came time to put together the Translucent Ham Sandwich Band he had a deep well to pull from. With a sound that is self-described as jam-core and improvillusional, the sound of THSB is one that is unpredictable and totally organic. For the “Censor Me” video, Stone took a similar approach as he does with improvisational music. The video is a daring mixture of bright colors, trippy filters, and mind-boggling visuals. At its core are shots of Evan serenading the camera (complete with plastic pig nose), THSB performing live, as well as a dose of action shots of the southern California streets at night. It’s a winning formula and will certainly turn heads and turn fans onto Evan Stone and the Translucent Ham Sandwich Band. It’s our great pleasure to be working with this exceptional outfit and would love to do whatever we can to help get this video into your programming. Please give us a call here at HIP Video Promo at (732)-613-1779 or email us at info@HIPVideoPromo.com . 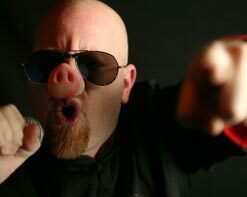 You can also visit www.FollowTheHam.com/ for more info on Evan Stone & The Translucent Ham Sandwich Band.